RHYS BOWEN: Today my latest baby comes into the world. 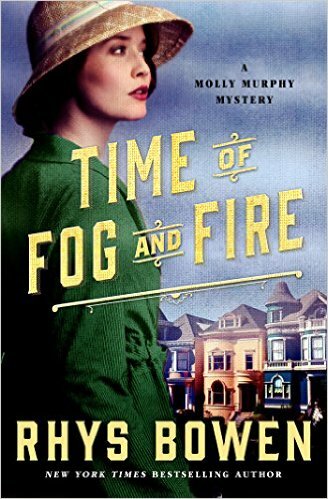 It's the sixteenth Molly Murphy novel and it's called TIME OF FOG AND FIRE. 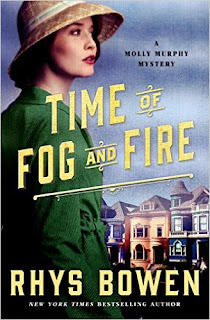 When you write historical novels, when you set a story in a particular place and time, I think it's important to think about what was really going on at that time. Was there an election? If so my heroine would be aware of the campaigning on the streets. Was there a disaster? In which case my heroine might also be affected (as in the 1905 crash of the 9th Street El that figures in The Edge of Dreams). My time period for Molly moved into 1906, and I realized that I couldn't write about that year without including the biggest event that took place in America--the San Francisco earthquake and fire. This is familiar material to me, having lived just outside San Francisco for the past forty years. For the first years of our marriage we lived in a hillside cottage built in 1903. I reassured myself that if it had survived the 1906 earthquake it could survive subsequent ones! And I'm conscious when I drive through the city how many decorative cornices there still are, waiting to drop on pedestrians in the next great quake. 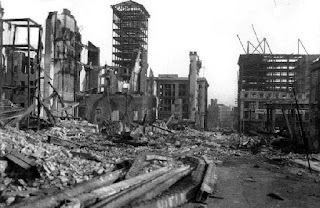 Even though the destruction of the quake was enormous, it didn't kill many people. It was the subsequent fire that did the greatest damage. It raged throughout the city for days, because the water mains had been ruptured. Also the army tried to create a fire-line by blowing up buildings and only succeeded in increasing the size of the fire. 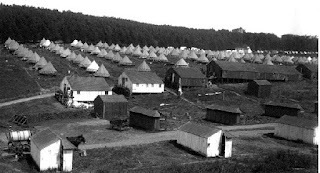 After the quake huge tent cities were put up by the army in all the parks. The mayor (who was about to be indited for corruption when the quake hit) promised to rebuild bigger and better, and miraculously his promise was kept. Research was easy because there are so many first person accounts and photographs stored at the San Francisco historical society. Vignettes one could never make up: Chinese men escaping from burning Chinatown carrying a song bird in a cage while their wives hobbled behind on bound feet, trying to keep up. Bullocks escaping from a stockyard and trampling people in the streets. Soldiers ordered to shoot for looting accidentally killing those who went back into their own homes to rescue prized possessions. So much drama and tragedy to write about. And you might be wondering what Molly was doing there, in the midst of all this? The San Francisco earthquake is of great interest, but I really just want to find out what Molly is doing . . . . Very excited for this book, since I have so many relatives (most of whose parents were living there in 1906) and friends in SF and know the city well! Happy release day, Rhys. So using it to say hurray Rhys! Yay! Sounds fanTAStic, Rhys... what an interesting time for you and Molly. Sometimes recent tragedies feel to raw to write about for, well, for years after. I wonder if that was the case with the SF earthquake which of course now feels so long ago that it's 'safe' to use in fiction. Don't tease, tell us a little more about the book?? Happy book birthday and congratulations on your LCC win. What an amazing backdrop for a story. I can only imagine the photos and accounts of it. Thank you for the good wishes, everyone. If you live in California or Arizona or Texas do check on my event schedule. See some of you at my signings, I hope! Happy book birthday, Rhys! And wow, sixteen books in just this series. That's what you call a body of work. Well done. Susan Shea asked me to share that Reine had won a copy of her new book. Such an interesting time in the history of our country. And Molly and Daniel in the middle of it! The teaser you gave of Molly seeing Daniel in the newsreel has had me waiting not so patiently for today. I sure hope my pre-ordered book does arrive today, as I'm finishing another book, so it's perfect timing. So, Happy Book Birthday, Rhys! How one person does so much quality writing is the mystery to me, but you keep giving us so much to love and appreciate with Molly and Georgie. Congratulations again on your LCC win. I'm guessing that won't be the last we hear of award nominations and wins for you this year. Happy Pub Day, Rhys! What an amazing and dramatic setting for a novel, and fitting in with our discussion of weather adding suspense in books - we should have included natural disasters! Happy pub day, Rhys, and congrats on the Lefty!! I wish you were coming to Dallas!!! Happy Pub Day! I can't wait to read this one. There must be so many fascinating stories that happened during and after the earthquake. Molly and Georgie both get to move around, such a gift to their author! Congratulations on a new launch, Rhys! Reine, the goblins got into Rhys's typing fingers. Please email me at: scsauthor@mac.com for your copy of Mixed Up with Murder. Oh, Rhys, I do understand! Did I ever tell you how much I love Molly... tons, tons, tons! Congratulations on the release of your new book! I wish you much success.